What To Do With Byron Buxton? On Tuesday, the Minnesota Twins activated Byron Buxton from his fourth separate stint on the disabled list this season. It's been a nightmarish year for the outfielder, but now Minnesota must look ahead. How should the Twins handle their embattled franchise centerpiece, presently in Triple-A, as the season winds down? It's a thorny issue with no easy answers. Buxton returns to a Rochester Red Wings team with 22 games remaining on the schedule. Their season runs through September 3rd, at which point (if not before) the Twins will need to make a decision. I find myself torn here. I love Buxton. I love watching him play baseball. The Twins are a more interesting team to watch with him on the field, even while struggling. I also want to see a very likable and (outwardly) unselfish guy get his due. Buck's an established major-league player, with more than a thousand plate appearances under his belt, and there's no question he can help the Twins in September, even if still broken at the plate. Assuming his toe is back to 100%, you won't find a better pinch runner or defensive replacement. There's also this: The Twins kinda need Buxton to figure it out at the big-league level in short order. Patience is becoming an unaffordable luxury. He turns 25 this offseaosn and will be eligible for Super 2 arbitration. Starting over again in the minors next year is hardly palatable. Might as well get him as many ABs as you can the rest of the way. There is a bigger picture at play, yielding two crucial considerations. First: Buxton's health. The old sports adage "bubble-wrap this kid" has never seemed more plausible as a literal course of action. The 24-year-old has barely been able to go two weeks without getting hurt or aggravating a previous malady. On two occasions this year, the Twins have brought him off the disabled list before an injury was fully healed. I'm not claiming medical malpractice here – these things happen. But why risk letting them happen any more in a totally lost season, for both player and club? Buxton's recklessly aggressive playing style puts him perpetually at risk, and that's before you account for the possibility that his left wrist, which he's injured significantly at least twice in the past, won't be a lingering issue, nor the fractured toe that never received much time to heal. A jumpstart to the offseason, with an extra month to rest and recuperate, wouldn't be a bad thing from any perspective. Second: Buxton's service time. As Mike Berardino pointed out when Buxton was optioned, Minnesota stands to gain an additional year of control (2022) should the center fielder fail to accrue another 13 days in the majors. Pretty straightforward math here: Is one month of Buxton, utterly out of sorts at age 24, worth forfeiting a full season at age 28, when he's hopefully amidst his superstar prime? On the surface it's a nonstarter. From a strategic standpoint, that one year of team control is enormously valuable, whether the Twins wanna run out his clock, or leverage it in extension or trade talks. Derek Falvey and Thad Levine are well aware of this, to be sure. And it's not like they would be totally unjustified in leaving Buxton off the September roster, should his performance in the final 22 games at Rochester resemble that in the first 22 (.215/.295/.380, 32% K-rate). When Minnesota exercised that his option in July, it was a directive to get healthy and on track, earn his way back. Thus far I'm not sure anyone can argue that he has. But it's certainly not for lack of effort. No one who's ever met Buxton would question his heart or his commitment. The man has endured some absolute crap luck and in a way, opting not to recall Buck would be penalizing him for it. Pushing back free agency a year would be lovely from the team's perspective, but it'd be a major gut-punch for the player. As Dr. Dre once said, "Sometimes the business end of this sh*t can turn your friends against you." Shutting Buxton down in September would unquestionably be the sound business decision. But is it worth creating ill will with an incredibly talented player you view as a long-term cornerstone? My view, right now, is that if Buxton shows serious improvement over these next three weeks in Triple-A – in terms of process more so than results – I bring him back up to play regularly in September. I'm curious to hear what you all think. Call Buxton up in September? Sooner? Rest him and claim the extra year of service? Or should the outcome be merit-based, and if so, how do you make meaningful determinations over a couple dozen games? Let him stay a Rochester for the rest of their season. The Twins aren't going anywhere this season. When Rochester's season is over, bring him up. He needs all the playing time he can get this year. Ouch, I feel you on this one. I'm completely torn as well, but in the end I have to think about it like I would my son (yes he's a pitcher, so I guess that makes me more cautious). Shut him down, his future health is way more important than a few extra games for our enjoyment. One of the decisions a TD moderator has to make is which forum a given article belongs in. After seeing this one's title, I had to stop and think - major league forum, or minor? After reading Nick's article, I'm no more certain than when I began. Trade him? Mostly kidding.... Mostly. They will probably CALL HIM UP!!! All kidding aside, he probably needs to get some work in against mlb pitching. Let him work a part time role, getting reps and seeing mlb/milb pitchers. Remember, he'll get his share of young pitchers to hit against in September. That is probably the right way to use the last month of the season with him. I don't think the extra year matters if he doesn't improve at the plate. At that point, his speed, and thus his defensive range, will likely have degraded somewhat. So, would it really be that expensive, or even be worth keeping around, if he slides back towards the mean defensively, but doesn't approach it offensively? If there is even a minute chance that some September playing time gets him back on track going into next year, you have to take it. I don't see how sending him home would help anything in any way. 1) Buxton hasn’t looked like an MLB hitter in any way. 3 weeks of triple A hitting isn’t going to change my opinion of that. He would probably start 19 in triple A too. 2) The FO needs to make sure they have team control of Buxton for the extra year. If he’s healthy, he needs ABs. Appy fall league sounds like the best way to get him some. I don't think this one is too hard. He finishes the season in Rochester. If the Twins were in it, Id' call him up. We aren't, and Buxton is a big reason for that. He stays home. His instructions are to bulk up a bit this offseason. He needs more padding so to speak, even if he loses a step. My plan for 2019 is simple. He has an option. It will be used. Buxton will earn his next trip to Minnesota. If he earns his way back to the majors the Twins should bring him back. If he doesn't, shut him down at the end of the AAA season. So far tonight he's 3 for 5 with a HR and 4 RBI....He keeps hitting like that for a few weeks and he'll be called up to finish the season with the Twins. it was a pivotal move as it exhausted the team's final option on Buxton. Are you sure? Unless the Twins messed up the paperwork when they sent Byron to the minors on rehab assignments in 2015 and 2017, I count only 2016 and 2018 as exercised minor league options. That would still leave one, as Diehard says above. But I'm no expert on the arcana of these rules - it's all black magic, I tell ya! Nick you did a great job presenting all sides but this one is an absolute no-brainer. Buxton does not see Minnesota soil for the rest of 2018. If he gets September off... he gets September off. Call it for the purpose of getting healthy but it is primarily for the purpose of getting that extra year... back. Buxton has nearly burned 3 years of service time and has produced 340 K's and 70 BB's in 1074 AB's. Career BA .230 - Career OBP .285 - Career OPS .672. This is not the superstar production that the scouts predicted he will produce. What this is... is nearly 3 years of service time wasted culminating in some of the worst offensive numbers ever produced this year. If you believe the scouts are right... you have to wait for it. If you have to wait for it... you need time to enjoy it when it finally arrives. That extra year is huge in case the scouts were right. If you call him up for a month worth of AB's in a lost season, what do you gain? I don't believe that a month of AB's are going to be the springboard to a changed man in 2019 and I know that his defense isn't going to get us into the playoffs this year. When you give up that extra year of control... you run a very real risk that Buxton figures it out, becomes the player the scouts predicted, the player we dreamed of... right before he hits free agency and we get 1 maybe 2 years if we are lucky of Good Buxton to go with the 4 or 5 years of Bad Buxton. If the front office burns a year of his control, while it is easily avoided and justifiable in consideration of production and health. And do it THIS SEASON with nothing to play for. It could only be viewed as irresponsible. If Buxton considers this a "gut punch". Better him than me. Because he has been gut punching me for 3 years and if we lose a year of superstar Buxton because of September AB's of Bad Buxton... that will be more like a cannonball to the crotch. A gut punch will feel good by comparison. This is coming from a guy, who looks at the terms of the CBA and consistently sides with the players. I do think they get the short end of the stick. But, the CBA is an agreement that a GM needs to consider when making decisions on long range plans. Until the CBA is changed to something more equitable to the players... I sincerely hope that my teams front office utilizes the rules of the CBA to their advantage and ultimately as a fan... that is also the front office acting on my behalf. Would a video montage of him laying off breaking pitches in the dirt for the next 3 weeks help change your opinion? Here's hoping that it's possible to compile such a video, at AAA season's end. Which is my way of saying... we have a few more weeks to decide on Nick's question. You are correct -- Buxton has only burned options in 2016 and 2018, so he has one left for 2019 or beyond. In 2015 he spent fewer than 20 days on optional assignment; in 2017, he wasn't optioned at all -- just rehab. Roster Resource agrees -- they show Buxton with 2 options left (they haven't deducted his 2018 one yet). If he doesn't improve at the plate. The extra year will not matter. The scouts who predicted super-stardom will need to be fired of course. I checked a more definitive source: Out Of The Park Baseball 19. I say shut Buxton down after Rochester’s season ends, and then have him work with someone in the off season to help improve his swing and get him mentally ready for 2019. I still see Buxton as an important piece for us, but instead of bringing him back and watching him fail some more I think Buxton needs to take a step back, get some good coaching and practice time in the off season and come back a new ball player in 2019. So with that 2019 option remaining, it is still possible to get that extra year of team control, even if they recall him this September. If they recall him after Rochester's season concludes, it looks like he would finish this year with 3 years and 14 days service time. If he was optioned for at least 29 days in 2019 (or 2020), we'd get that extra year too. A little trickier, but not implausible, especially if we acquire another outfield option. I understand the appeal of Option 1, but this is probably a no brainer: It's Option 2.You spend the offseason helping him build up his resilience and durability to injury and hit the reset button. The only reason to do Option 1 is emotional, so I'd rather go with the more rational option. Buxton had a terrific night in Rochester. Time to call him up in September. Another year of control, even though I am opposed to the system.....the system exists. this isn't keeping him down at the start of a year, when wins matter........so, whatever they have to do to get another year of control. Send him to FtM or someplace to hit and hit and hit....and hit some more. than hit again. Shut him down, let him get fully healthy.Gives him a mental break as well.The extra year of team control really cements it. So overwhelming opinion is he gets shut down? I'm very strongly in the belief he plays with the twins. If healthy, of course. Maybe I'm wrong, but I'll be extremely surprised if he doesn't play for the TwinS again this year. He needs mlb at bats, not aaa. He has the talent, and has shown he can succeed in this league. I'd be somewhat OK with this. Call him up when there only enough days left in the season to get that extra year of control. There’s no rule that says call ups have to be on Sept 1 or on the day the minor league season ends. Twins get the extra year. Buxton gets a handful of AB against MLB pitching. 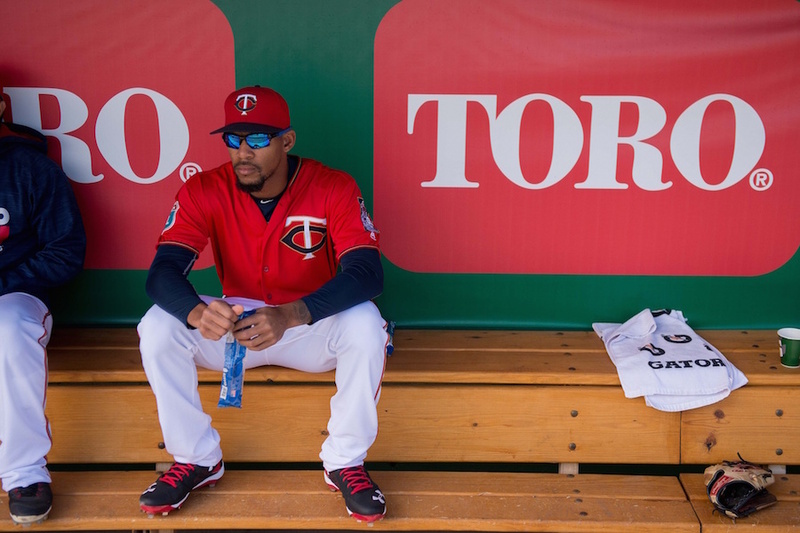 → Article: What To Do With Byron Buxton?